Course was out to Platform Habitat to Platform Hogan and back. Max. wind 31 knots. I love those boats. No drama, not a lot of work, just go like f%ck! I think I'll share your video with my crew. 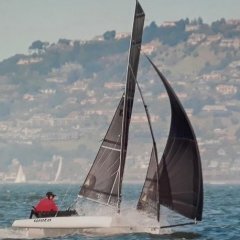 Maybe we should have the SB-KH Race in April! Instead of the enchilada derby. There are Enchiladas in Santa BooBoo and Redondo, too! It never blows in Santa Barbara. next time you need rail meat hit me up ! that looks so fun ! 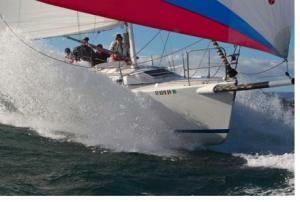 Can we get a 6th J/125 to enter transpac?? That's a lot of white hair, Larry! It's really very, very, very light blond. There was dock talk of one more J125 signing up, getting a little late now but you never know. Would be nice to have our own class for Transpac. How many J125 will we get for for the SoCal 300? For 2017 Warrior will probably stay closer to home. SB to KH will the furthest we'll be going. Next year might be a different story. No, only when a prediction is called. I heard on the docks that a new J-111 lost its rudder in this race. Rock and Roll was dnf. Anyone know what happened? ....and a cal 29 was dismasted. It is new to Santa Barbara but an early J-111. 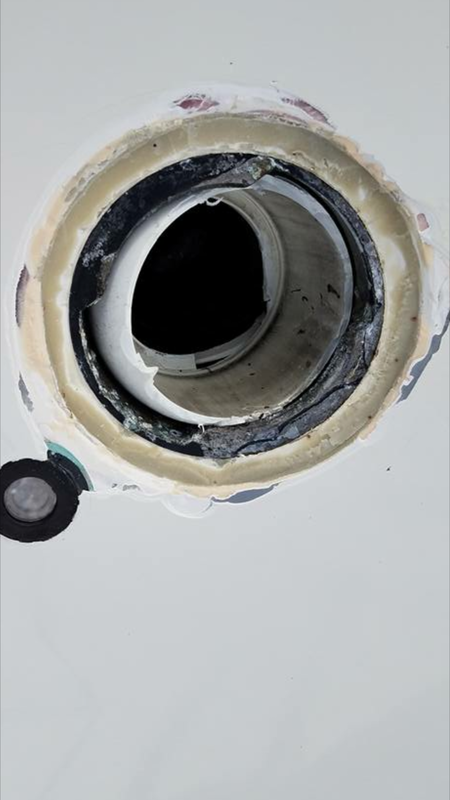 The rudder post broke just above the stainless steel collar and below the quadrant. Eventually the rudder worked it's way out and was found floating a day later. All on board were safe. they were lucky it happened in the open ocean instead of on a lee shore. rudder post made out of.....? I believe it was carbon with foam core. Looked at this J-111 keel in the boat yard. To me it appears that the tall skinny keel lacks sufficient area for lateral resistance moving part of that load to the rudder. could that be an issue in the failure? why would a rudder post ever have a foam core??!! Rock & Roll is Hull #3. Call Bennett G from Perseverance, he might have a spare Rudder hanging around. Do you think it's class legal? wait...the last rudder was hanging around...then it fell out. I am not a naval architect, just an insurance underwriter but I think building a stronger rudder post is not the final answer. From where I sit it looks like that skinny keel is placing tremendous forces on the rudder which is providing lateral resistance on a high wind reach. I went to the J-111 web site and they have about 2 dozen pictures of the boat, none showing anything below the water line. 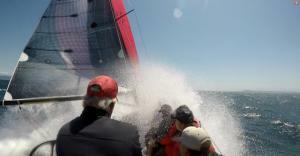 I know these boats are fast but insurance underwriters get off on safe. I don't know what happened but Rock and Roll is in the yard. Maybe a coincidence. You know nothing about the boat's seven year lifespan. It's on at least its third owner. Rudders can easily get damaged during transport. You might not see this damage until later. They may have hit debris or a whale in the water. 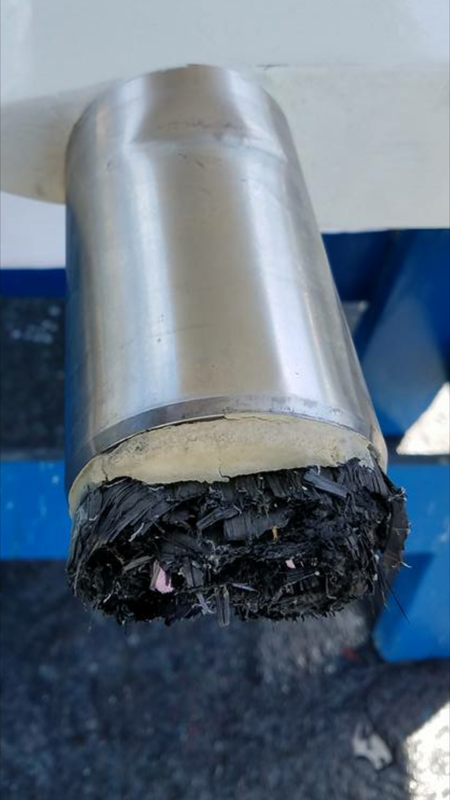 A boat I worked on had its Mast damaged while it was boxed up for shipping. You couldn't see the damage, it looked like a two inch scratch. We started diggin, and the damage went thru the tube wall of a very expensive spar. Done, had to have it replaced. It may not have failed the first time out, but it would have eventually come down. Here is the bottom of the hull where the rudder used to live. is that an LED,kelper or a mini cam? I believe it's a mini cam, not positive. I have a cam on my J105 for my rudder. Mine is an aftermarket auto backup camera with its own small display mounted just inside the companionway. Works great. Cost less than a $100. So maybe they have tape of the rudder breaking off? Windy Wet Wednesday April 26th. any pics of the aftermath ? looks like it got ugly. Inter 20 - Are you the new Janer keeping us current on all things Santa Barbara? i don't see a protest flag so any protest is disallowed. Wow, I'll say. Although it is a nice job you are doing lately. You guys going to be out on May 31st? 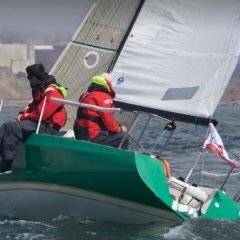 We will be down for the start of the SoCal 300, would be fun to have some heads up J/125 racing. Another windy day in Santa Barbara. The boys out for high school practice. I dig the shots of the boat reaching on a plane. But, why so much water in the cockpit? Doesn't the boat have an open transom or at least have transom scuppers? I use to race an FJ in the late 60s and early 70s and we had scuppers in the transom with flaps on them. Yes they have scuppers in the transom but with that much water coming in, they aren't able to keep up. Turn up the sound. Better version than the original.